I made the soup from fortheloveofcooking, then changed it up a bit because I wanted to try gnocchi instead of the russet potatoes. Olive Garden has a relatively new soup on their menu with gnocchi and chicken and feeling a little adventurous, I thought what the heck, go for it. You will only need to simmer thirty minutes if using gnocchi, adding the gnocchi in the last three minutes. Let me know if you like it. Gene said you could smell it all the way to the front pasture. Hope the cows don't mind--it's not Chickn. The aroma brought me in early from the pasture, for sure. 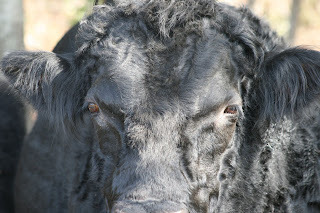 This photo is of "Ace", our main-man bull. He had the number one on him when we found him and he was the only bull for a while. The name made sense. He is a very friendly type, will let you approach him in the pasture and rub his head. He weighs in at about 2000 pounds, thus due caution is advised. Never,never,never get between Ace and his food.